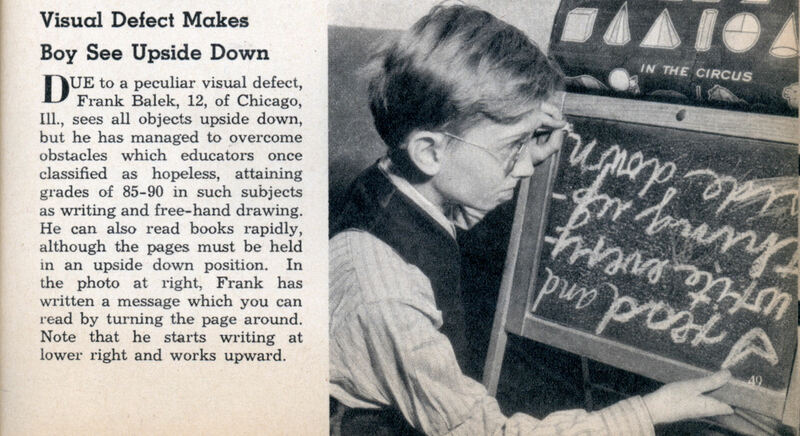 DUE to a peculiar visual defect, Frank Balek, 12, of Chicago, ill., sees all objects upside down, but he has managed to overcome obstacles which educators once classified as hopeless, attaining grades of 85-90 in such subjects as writing and free-hand drawing. 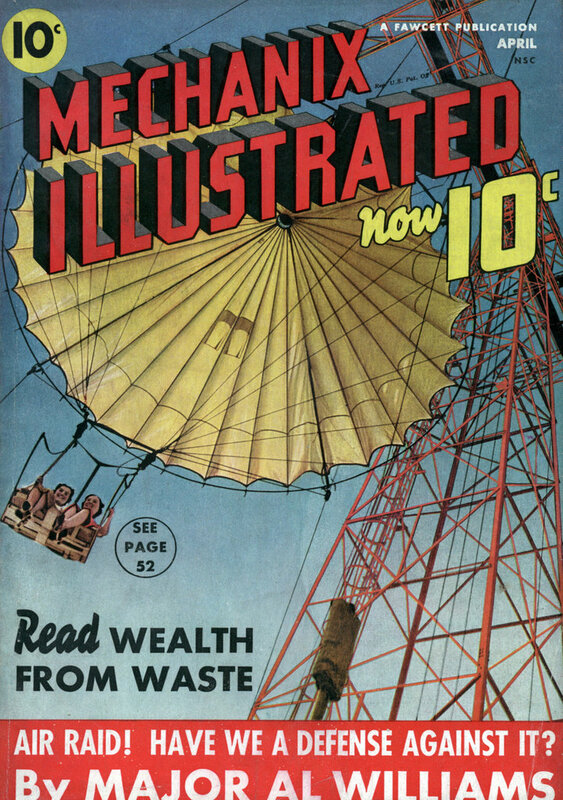 He can also read books rapidly, although the pages must be held in an upside down position. In the photo at right, Frank has written a message which you can read by turning the page around. Note that he starts writing at lower right and works upward. Poor kid; that’s often a sign of a problem in the cerebellum. There’s not really even any clear meaning to the term “sees all objects upside down”. Does that mean that if you asked this kid to point at a passing bird, he’d point down at the ground? I suspect that whatever was wrong with this kid, if anything at all, it wasn’t a simple inversion of the visual field. Perhaps something akin to dyslexia. Or, as Charlene said, some kind of brain damage, perhaps causing an agnosia of some sort. Daniel, it’s a rare condition but one known to medicine. It’s almost always due to a problem in the brain itself – often a stroke, but also a benign tumor or even a bad head injury can in rare cases cause this. I suspect the writing on the chalkboard was simply a trick for the photographer, but the phenomenon is very real and it isn’t as easy to compensate for as you’d think, especially when it happens after about age five. I am trying *so* hard not to make a Fresh Prince of Bel Air joke. I have the problem of seeing backwards sort of. It’s not really a problem, I had no problem learning to read though I had problems early on with writing. I can read and write as well backwards as fowards now. I do have problems using a screwdriver or wrench when looking at my hands and I don’t use a mirror to shave. I can use screwdrivers or wrenches in both hands and inverted. Yes I do have damage from meningitis as an infant. ???s ? ???? x?? o? s?ss?l? l??? ?ds ???? ? ¡? ?lqo?d ?? ?s s??? ???? ? Re #10, considering there are still superstitions about pregnancy that people swear are true, the flying upside down comment doesn’t surprise me that they’d have to reassure people there wasn’t a problem with it. Hell, even doctors will agree we only use 10% of our brain in spite of decades of clinical reports to the contrary. Arglebarglefarglegleep: We only use 10% of our brain? No, doctors don’t say that. It’s a myth. Guyz its simple .,.,its just our eyes actually sees everything upside down only.,.but for normal people its just get identified by the brain @ optic chiasma , so its lyk our brain identifies the upside down image to be correct gives us the normal image.,.For tis guy tis identification part of the brain is not workin !!!!!!! I”m tutoring a 3rd grader (female) whose world is totally upside down to ours. She reads very well with a mirror. I’m looking for a medical referral to someone with experience in vision therapy that can help this young lady adapt to a normal world if possible.